Hello! Welcome to the first day of Taylored Expressions Sneak Peeks! We didn't have a July release because of CHA and the release of our new web store, but we're back now with a BIG release for August! Today the Baker's Dozen kicks off 5 days of projects (3 days of peeks, release day and spotlight day). All products will be released on Thursday, August 8, @ 8 AM PST. Before I show you my projects, I'd like to welcome the newest member of the Baker's Dozen, Joan Ervin! She is no stranger to TE, as she was our fabulous guest designer for May and June. I'd also like to give a big welcome to our wonderful August and September guest designer, Heather Jensen! Both of these ladies are uber-talented, and I can't wait to see what they both cook up! Today I am previewing the Build a Scene Dies and a new stamp set, Hey Sweet Tea. The Build a Scene series of dies was concepted by Sankari, who creates the most amazing scenes! Hey Sweet Tea is a continuation of Jami's jar series. It features a fun mason jar which you will no doubt love as much as I do! First up is a card using two of the four Build a Scene dies, Build a Scene - Swirly Clouds and Build a Scene - Rolling Hills. 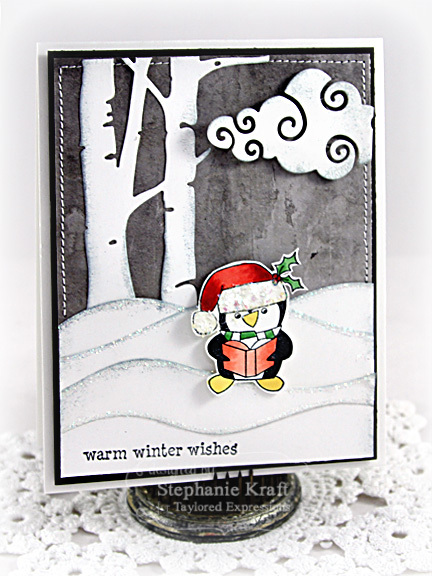 I paired the new dies with the Birch Tree Border and the Penguin Pals stamp set to create a fun little winter scene. Here's a detail shot of the caroling penguin. How about we switch from winter to summer? Nothing says summer like a mason jar full of lemonade, right?! 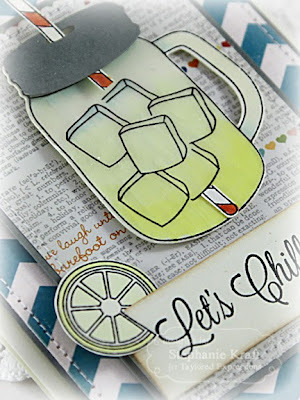 Here's a card using Hey Sweet Tea and the coordinating Mason Jar Glass & Lid dies. Accessories: Taylored Dies: Build a Scene – Rolling Hills, Build a Scene – Swirly Clouds, Birch Tree Border (TE); Markers (Copic), Mica flakes, Starfire glitter, Foam tape, Thread, Sewing machine. Accessories: Taylored Dies: Mason Jar Glass & Lid, Banner Stacklets 1 (TE); Markers (Copic), Glossy Accents (Ranger), Silver sequins, Pale yellow pearls, Foam tape, Thread, Sewing machine. Cute card Stephanie! Love the sweet penguin! His shimmery hat detail looks darling! Oh - I love that you used the B-A-S to create a winter scene and especially that you used a penguin - how fun is that!?! And your lemonade is adorable - great the way you used the straw! Totally cute scene, Stephanie and now I have a craving for some lemomade!! 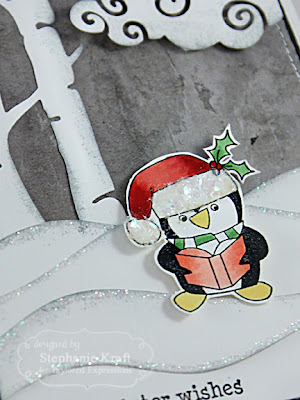 Ooooh, what a darling winter scene with the sweet little penguin and all the BAS dies....sooo cute!!! I love your jar of lemonade, too...inserting the straw into the lid is such a clever idea!!!! Fabulous Stephanie! I LOVE LOVE LOVE the hills and the birch trees together. Brilliant thinking! 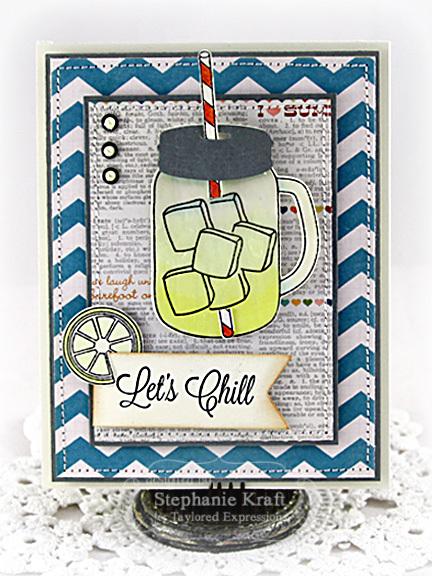 I love your lemonade jar too - the lemon peel on the sentiment panel is seriously inspired! How clever to use the dies as a winter scene! Love your sweet penguin, he looks right at home in the freezing night snow! Love how you put the lemon on the banner too, too cute!